Several of our physiotherapists have specialised in Sports Physiotherapy. This form of physiotherapy deals with the treatment of sports and exercise related injury. These injuries can occur at any age and any level of fitness. You may have a child or adolescent with overuse injuries, or be a high level team or individual competitor. Perhaps you are a weekend warrior, a social golfer or a tennis player. No matter what your sport or level of fitness, you are susceptible to injury from time to time. And that's where we come in! If you become injured, it is vital that you seek an early intervention. Otherwise you risk a prolonged period on the side-lines. Our physiotherapists work closely with consultants, GP’s and other healthcare professionals to ensure the best possible treatment and care for you. And we don’t stop there. The rehabilitation you receive will include specific conditioning for your sport and your position on the field. We work with you to prevent a reoccurrence of the injury by assessing the factors that may have led to your injury such as muscle imbalance, inadequate core control or poor equipment. 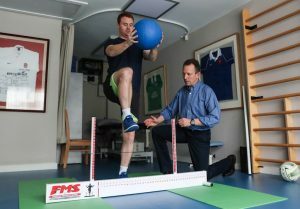 All of our Sports Physiotherapists have years of experience in treating athletes that compete at the top of their game. Indeed, several of our therapists have represented their country at international level. They know first-hand what it’s like to be side-lined through injury and how desperate you are to get back to full fitness as soon as possible. Ailbe, Dominic, Fionn and Ursula have post-graduate qualifications in Sports physiotherapy. So, check out our team of Physiotherapists and choose the one that’s right for you and your sport.